[dropcap]M[/dropcap]ichael began training in the performing arts while studying biology at William Paterson College in Wayne, NJ, where he appeared in several college productions, one of which earned him the Award of Excellence at the 1981 Kennedy Center American College Theater Festival. Later that year he began formal dance training as a certificate student at the Ailey School-New York City. Upon receiving a Certificate of Dance, he received a full scholarship to continue training at The Ailey School, during which time he performed with the Nanette Bearden Contemporary Dance Theater, Blue Mercury Dancing Company, and Michiyo and Dancers. 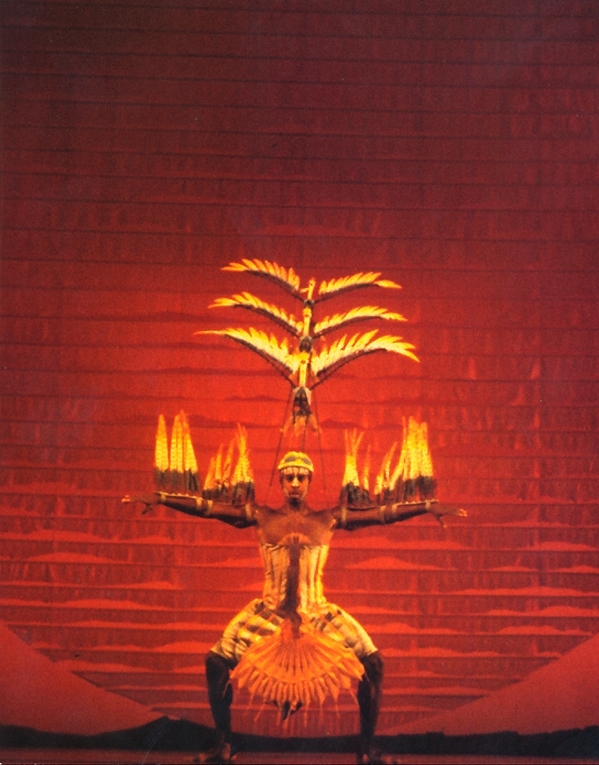 In 1984, he joined Ailey II under the direction of Sylvia Waters, where he performed until 1986. He then traveled to Rome, Italy to perform as a featured dancer on the weekly variety series, ‘Premiatissma’ and in several other Italian television productions. Returning to the U.S. in 1987, Michael appeared with the famed Rockettes in Radio City Music Hall’s Christmas Show, performed with Gallman’s Newark Dance Theater, Dennis Wayne’s Dancers, Elisa Monte Dance Company, and worked as an assistant to the renowned choreographer, Talley Beatty. 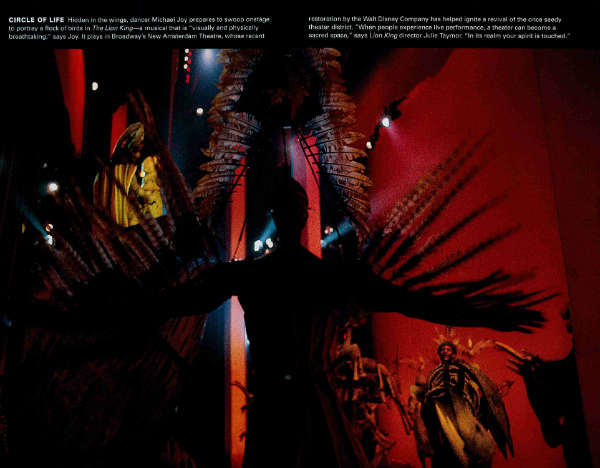 In 1989 Michael was personally asked by Alvin Ailey to join the Alvin Ailey American Dance Theater where he had the privilege to work with and perform the works of many of the world’s foremost choreographers, including, Donald Mckayle, Judith Jamison, John Butler, Jerome Robbins, Lar Lubovitch, Garth Fagan, Billy Wilson, Jawole Willa Jo Zollar, Shapiro & Smith, George Faison, Louis Johnson, and Donald Byrd. The Ailey Company also allowed Michael the opportunity to perform at many of the world’s most prestigious theaters and cultural events. Including the Garnier Paris Opera, Odeion of Herodes Atticus (Athens, Greece), Cairo Opera House (Cairo, Egypt), Lincoln Center (NYC), Kennedy Center (Washington, DC), President Bill Clintons’ Inaugural Celebration, The Olympics Arts Festival-1996, Biennial Dance Festival (Lyon, France), Spoleto Dance Festival (Italy), and the Spoleto Festival U.S.A. Most recently, Michael appeared on Broadway as an original cast member in the Tony Award-winning musical, ‘The Lion King.’ He has also appeared in television commercials and in several films, television, and stage productions. In 1996, Michael was awarded the Richard Porter Leach Fellowship by Empire State College-State University of New York, to continue his college education. Mr. Joy has served as Director of Artistic and Educational Programs for Kansas City Friends of Alvin Ailey since 2006 and AileyCamp Director since 2002 while finding time to teach dance and choreography. 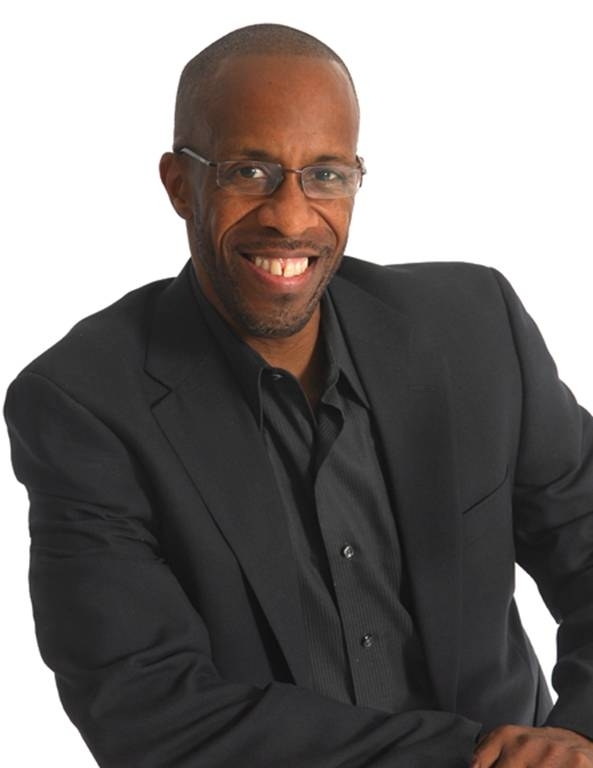 His teaching credits include Alvin Ailey American Dance Theater company class, KCFAA’s original Ailey Male Trio, Ballet Instruction-AileyCamp Boston, Guest Teaching Artist at Paseo Academy of Fine and Performing Arts-Kansas City, and extensive work in the both the Kansas City Missouri and the Kansas City Kansas Public Schools. He has recently choreographed several local theatrical productions including Rent, Dream Girls, Chicago, Smokey Joe’s Café, Jesus Christ Superstar, High School Musical, and Hairspray. Michael finds his greatest fulfillment when a young person makes the realization that power resides in the choices they make. It is that exact reason why we sought out Mr.Joy, to help us inspire and empower the youth and the next generation of dancers. It takes a special kind of person to dedicate their lives to helping others succeed. We are honored to provide a platform for Mr.Joy and others to do so on a regular basis. Dance Mogul: At what age did you discover your passion for the arts? Michael Joy: I can’t quite put an age on it but I do remember when I was young, four or five years old, there were lots of variety type entertainment television programs featuring singers and dancers. I remember pretending to be a performer on those programs making up dances and dancing around the house to records my mother and father played in the home. At the time didn’t know it was a passion for the arts, I was just and having fun. That passion stayed with me as I grew up, but the schools I attended only offered sports and band. Sports weren’t my thing so I experimented by trying to play several instruments but never excelled at any. It wasn’t until I attended college that I had the opportunity to really explore the arts and found that dance was my passion. Michael Joy: My first inspiration was my older sister, Karen. When I was about nine or ten she took an African dance class at the neighborhood community center. I wanted so badly to do what she was doing but there were no boys allowed. I would watch and do the dances when no one was around. Michael Joy: What I appreciate most about my parents is that they always allowed me to be myself. As long as I was serious and committed to an interest they stood behind me 100 percent. Of course at times they said things most parents do, like “you need to think about a back-up plan” and “you need to think about finding a job with benefits”, I understood they were only thinking as parents do, trying to protect me in the event things did not work out for me and wanting what they thought was best for me. I do know it’s because of their support I was able to complete the certificate training program at the Ailey School. Although I had to take out student loans to pay the program’s tuition and work weekends to earn money for my daily commute from a town an hour away in New Jersey, I was allowed to live at home and not have to worry about paying for housing and meals. I’ve seen hundreds of young dancers, many of them my friends that were forced to either put their dance training on hold or stop altogether because of the stress of having to fully support themselves while studying dance full-time and working in New York City. Michael Joy: I was on a college field trip to see Alvin Ailey American Dance Theater at City Center Theater in New York City. It was actually my second time seeing a professional dance company; the first was Paul Taylor earlier that year. In that performance, I saw “real people” on stage, not dancers. They were people I could identify with, not because they were African-American but because they were like people I knew in my life, in my neighborhood, in my town. I saw myself. It was then I realized I could be on that stage too and was determined to find out what I had to do to get there. Of course, I knew it would be a huge challenge but the passion I felt put no doubts in my mind. 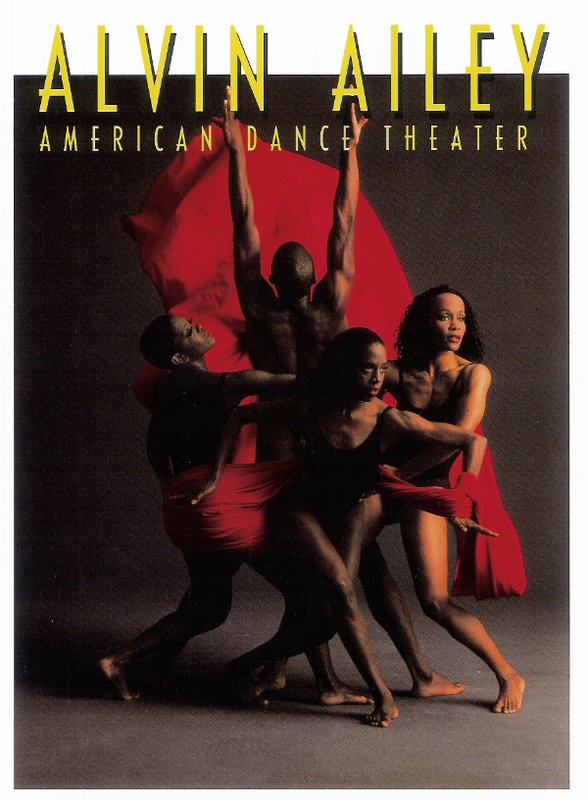 A few months later I attended an audition for the Ailey School and was selected for the certificate training program. Of course, there were those that tried warning me by telling me how competitive it would be and that I was too old to be starting out. I began training at age 21 in all beginner classes, joined Ailey II at age 24, and joined Alvin Ailey American Dance Theater at age 29. I remember receiving my ballet evaluation after my first term at the Ailey school. One instructor said I showed no improvement whatsoever and should consider pursuing something else. Fortunately, Denise Jefferson, the director of the school put me in a class with a different instructor. Very soon thereafter my ballet technique began to show improvement. Dance Mogul: How did you balance pursuing higher education and your dance training? 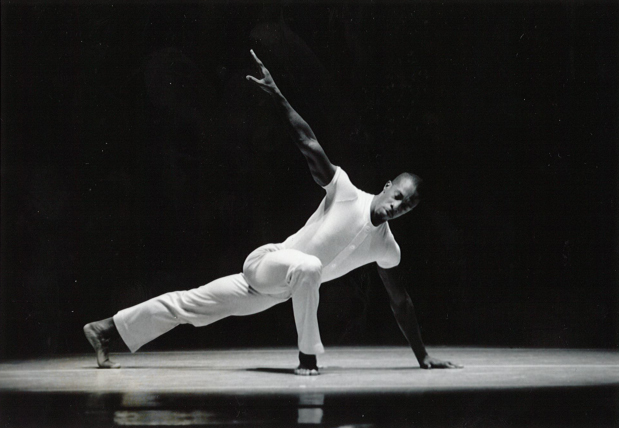 Michael Joy: Pursuing higher education came prior to attending The Ailey School and then later in my dance career. Following high school, I attended college as a biology major but soon found my way to the theater department. Though I never trained in dance I was often cast as a dancer in college theater productions. 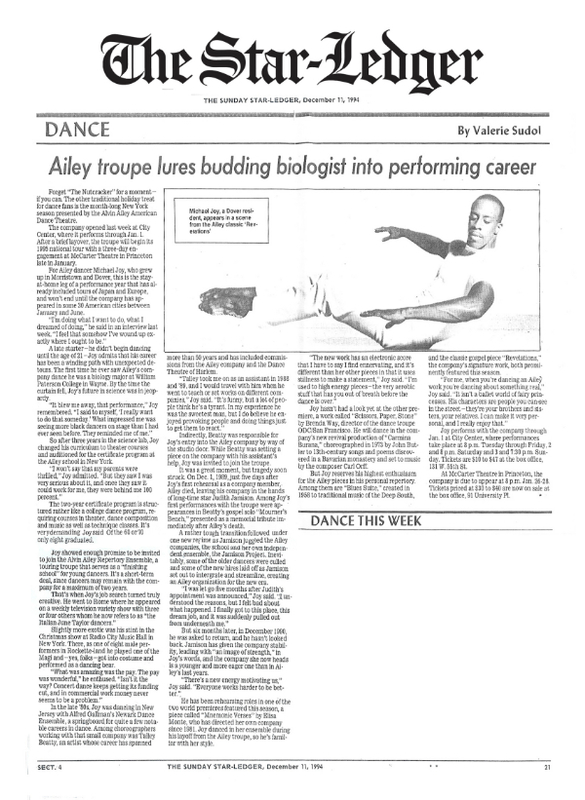 After two years in college, I left college to attend the Ailey School in the Ailey Certificate Program. The Ailey Certificate Program is a three-year program for advanced-beginner to intermediate level students, ages 17-23, who have completed their secondary school requirements. This program takes a conservatory approach to dance training, combining technique, dance academics, creative studies, and repertory and performance. Several years later before leaving the Ailey Company and while performing on Broadway in The Lion King, I applied for and was awarded the Richard Porter Leach Fellowship through SUNY Empire State College. The Richard Porter Leach Fellowship allows active and established performing artists to pursue a college degree while continuing to practice their craft. I do admit balancing both work and school was difficult but it’s all worth it in the end. Michael Joy: Some of my most memorable was working as an assistant to choreographer Talley Beatty. I learned so much more than dance steps from him. He shared information and stories with me about his life, travels, and experiences with the greats that he studied under and worked with including Katherine Dunham, Martha Graham, George Balanchine, and Syvilla Fort. What also stands out for me is having the opportunity to perform with and learn from many of the dancers I idolized such as Dudley Williams, Marilyn Banks, Sarita Allen, Gary DeLoatch, and Renee Robinson. Another memorable accomplishment was the opportunity to perform a President Clinton’s first inauguration. Michael Joy: In my particular case I learned that patience and perseverance are indispensable when it comes to discipline, determination, and dedication. Along with being committed and willing to work hard, it is also important to give oneself the time and space necessary for the body to incorporate change and build technique. Michael Joy: Today when so much seems immediate, I’m always telling young people not to be discouraged when things don’t come as quickly as they want. I’m a prime example where hard work and patience paid off in the long run. Additionally, I tell the younger generation of dancers how important it is to work on their craft outside the studio, that it has to become a way of life, a lifestyle. For example, I often hear young dancers talk about how much they want to become professional. Then I ask if they stretch at home, do they work on certain exercises at home, do they read, visit museums, or know of other cultures. To those that answer no, I tell them what separates a professional from armature is that professionals are working on their craft all the time, they practice even when they don’t feel like it. It takes more than just taking a dance class to be great. The more one knows about life, the world, other art forms, and cultures are the very things that will make them not just a dancer but a dance artist. Dance Mogul: We have seen a trend when dancers get opportunities that because they don’t get many, those opportunities go to their head and have negative effects on their career and their way of thinking. What do you think can be added by teachers/instructors to make dancers more well-rounded not only in the dance industry but as a productive citizen in society. Michael Joy: Opening the door to help young dancers learn requires that teachers/instructors are mentors first. People learn so much more from what they see on a consistent basis than what they hear. Old sayings such as “talk is cheap”, “practice what you preach”, and “walk the walk”, are very relevant when it comes to teaching. Not just in areas of training and technique, but more importantly in teaching life skills. As mentors, teachers/instructors should model behavior in humility, teamwork, how to best handle conflict and difficult situations, respect, self-respect, appropriateness, and giving back. In addition, teachers/instructors should help young dancers understand the business aspect of dance, teaching them that their craft is their livelihood. Young dancers also need mentoring in areas of negotiating contracts, working with agents, promotion, investments, financial planning, and higher education. Dance Mogul: How important is it that dancers try to leave legacies like Alvin Ailey instead of bits and pieces of momentary satisfaction? Michael Joy: I think of art it as the great communicator because of its ability to transcend cultures, customs, age, race, religion, language, ethnicity, gender, and economic circumstance. It’s the most basic and fundamental form of communication between human beings. As human beings, we have the ability to make choices every day as to how we want to be view or remembered. That being so, it’s important that dance artist realize the importance of their craft because of its ability to teach and advance us as a society. No all of us will necessarily achieve great fame as Alvin Ailey did, but we all do contribute in at some level to the advancement of all. Dance Mogul: What are you currently doing now to engage the youth? Michael Joy: I engage youth directly through my role as Director of Artistic and Educational Programs for Kansas City Friends of Alvin Ailey (KCFAA). I help develop, deliver, and oversee youth programming that uses the art of dance as a vehicle to improve knowledge, increase self-esteem, enhance critical thinking skills, and encourage positive role models and smart life choices. We reach more than 30,000 school-aged children annually through ten year-round programs. My work speaks directly to our vision, a diverse community united by dance to inspire and change lives and to the part of our mission that addresses teaching young people critical life skills through dance. Two programs, in particular, AileyCamp and KCFAA Studio Programs reach out to underserved populations and are offered absolutely free of charge. AileyCamp, designed to reach urban youth is an innovative summer program for middle school students using dance to develop their self-esteem, self-discipline, critical thinking skills and creativity and KCFAA Studio Programs provide a program of dance instruction, cultural field trips, and smart life choices seminars and activities for second through twelfth grade students during the school academic year. Michael Joy: Most definitely! In my work with young people I often see that they receive a lot of misinformation, mainly because they lack access to professionals in the field. Dance Mogul Magazine is an indispensable resource of accurate information for young dancers, providing the opportunity to learn from top industry professionals and benefit from a pool of extensive knowledge. Michael Joy: There are so many people that helped me and guided my journeys such as Denise Jefferson, Sylvia Waters, and Talley Beatty. But most of all I thank my Dad. He’s probably the hardest working man I’ve ever known. He worked in a fish market for nearly 35 years and after work did odd jobs to supplement his income. From the age of thirteen until I joined Ailey II at age twenty-four I worked with my dad in the fish market either after school, on weekends, and during the summers. I also went to work with him on his many odd jobs where I learned how to do almost everything from gardening to carpentry. Although at the time I was never too thrilled about working, I did like having my own money. As I got older and began dance training, I realized what I learned working with my Dad was the very things that helped me and continue to help me succeed on my journey. It wasn’t anything he said or taught me to do; it was the consistency of seeing him in everyday situations; his demeanor, humility, respect of self and others; in other words the quality of his character. From him, I learned that character and integrity is doing the right thing when nobody’s looking and in order to succeed one has to understand the value and importance of determination and hard work. I learned from him to be patient and always give my very best, that from challenges come opportunities, the importance of a positive attitude, and most importantly to believe in myself.